print and keep on hand. Free Membership, Live Profile, Special Needs Registry & Print out your own code! If you have found someone and are unable to scan the QR code please follow the link and enter the code. Come on out to an Event! Your Tax deductible contributions go to helping get safety products to people with special needs and keeping our website up and our prices down :)) We really appreciate your support! We are vendors with all CA Regional Centers for Safety iD kits. Please call 661-524-6732 or email Erin@ifineedhelp.org to process your request. All people with special needs. Customizable iD for your unique situation! Blogs Hot off the Presses!! Patches, Shoe Tags, iD Cards, Window Clings, Bumper Stickers, Dog Tags, Pins, Clips & More!! Learn about new features, products, and success stories! Your email info will not be shared. Click here to join our list. Wonderful creations by artists who have worked through personal challenges to create meaningful designs. 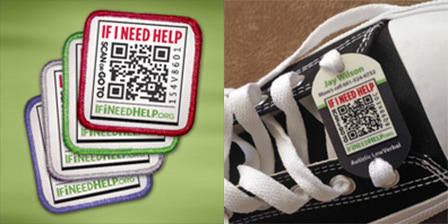 The If I Need Help designs have been selected to show how cool and loved our loved ones are! Please support the artists! Order Shirts and Hoodies with or without the QR Code patch.